Reader "Belt_up" asks in a comment what shakko ho is. I was going to post a hyperlink for him to follow, but when I Googled "Yoshinkan shakko ho," I discovered there is almost no reference to this practice on the Internet. Neither can I find photos or video to explain. So you know I'm not making something up, you can see "shakko ho" listed in the syllabus of this Yoshinkan dojo under the kihon. Shakko ho is practice moving in a standing position in Yoshinkan aikido. (Shakko ho is opposed to shikko ho, which is moving in a seated position. Now, I know there are other styles of aikido doing shikko.) I am informed by a reliable source that the literal translation of shakko ho is "diagonal-go-method". However, when I look in the Jim Breen dictionary, I don't see anything like that. If the search results in Jim Breen have anything to do with the aikido technique, it means something more like "distance-skill-method". Shakko ho is performed by starting in the Yoshinkan kamae stance and stepping forward with the front foot. As the foot goes forward, the hips make an S shape. The movement ends with the back leg straight and the front leg bent, and with the hips low to the ground and facing slightly off the center line. Then, without raising the hips, step forward with the back leg, hips make an S shape, and hips end facing slightly off center toward the opposite side. Aiki Web readers will already be familiar with Andy Carter from the news item "Battered Briton survives aikido ordeal" that was posted in the forums in 2010. 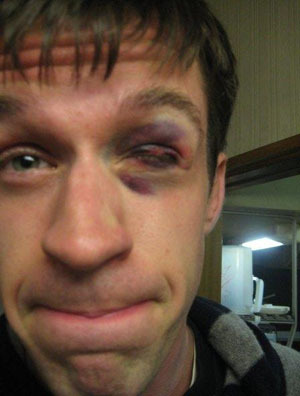 You can read about the story of this shiner in the article, but unfortunately the reporter failed to capture the experience of hearing Carter-sensei tell it live, complete with descriptions of trainees slipping and sliding in their own blood and knocking into each other. As I didn't read much of Aiki Web until a couple weeks ago, I had never heard of Carter-sensei before coming to Kyoto. However, his reputation still preceded him. The first couple times I made visits to classes here, Carter-sensei was absent, so I was just told about him by last year's kenshusei class. "You'll meet Andy-sensei soon. He teaches our fitness classes, but he does all the work right along with us." "He did the course at hombu two years in a row." So that makes two Tokyo senshusei courses and one Kyoto kenshusei course, and if I understand correctly, he intends to do the kenshusei course right along with us again this year. I wouldn't describe him as crazy, though. For anyone interested in martial arts, there is no replacement for living in Japan. This was impressed on me soon after arriving in Kyoto. I was minding my own business, riding my bike down the street and taking in the scenery like any tourist, when a middle-aged man on a bike passed me going the opposite direction and carrying an eight-foot-long thin purple clothe bag and a wooden quiver. Random encounter with kyudo-ka. Oh yeah, we've got that at home... not. About a week and a half ago, I was doing laundry. Villa Bianca has a washing machine, but no dryer, and we haven't got enough room to hang everything. So sometimes you have to take the wash to the laundromat to get it dried. The laundromat is only about a block away, so I popped in there around midnight. Sitting in the corner is a white guy with a little goatee. Normally, I keep to myself, but one thing I've learned since traveling in Asia is that the other people who don't fit the surroundings can be interesting and/or useful, so I tentatively introduced myself as a traveler visiting Kyoto for cultural studies. Yeah, I'm studying aikido. Have you heard of that? It's a martial art, you know, like karate, but a little different. We try not to hurt people.